A football player died after collapsing on the pitch 30 minutes after kick-off on Tuesday night. 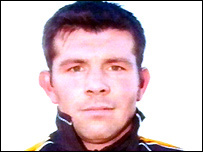 Paul Sykes, 28, was playing for Folkestone Invicta in the Kent senior cup semi-final against Margate. Attempts to revive him failed and he was taken to William Harvey Hospital, Ashford, where he later died. Police said the death was not suspicious, but the coroner would be informed. The club said the death had caused "great sadness". A statement posted on the Folkestone Invicta website on Tuesday said: "Everybody is in shock here. "Paul was well known to both sets of players having previously been a Margate player. "He is going to be sadly missed." Folkestone manager Neil Cugley told BBC Radio Kent: "He went running out of the penalty box and fell backwards. "Everyone thought he was messing about because he didn't mind a bit of play-acting and messing about. "It took people a few seconds to realise there was something very wrong. "The ambulance was there within minutes, but when he got to hospital he was pronounced dead."